The recent boom in shale gas production and the subsequent decrease in the price of natural gas have left some wondering what the role for energy efficiency will be in the future. As a new ACEEE white paper  explains, energy efficiency measures are still cost-effective in any foreseeable natural gas price environment. States should deploy cost-effective and readily available energy efficiency measures now to help provide long-term stability to the electric and natural gas markets and ensure that natural gas resources are used as efficiently as possible. 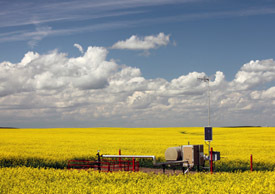 Historically, the natural gas market has experienced booms and busts where prices ranged from $2 to $16 per million British thermal units (MMBtu) . Last winter, the United States entered a boom period driven by unseasonably warm weather and an explosion of domestic shale gas production and prices at historic lows—under $2 per MMBtu. Looking forward, ICF International forecasts that prices will not remain at the current low levels. ICF estimates  a steady increase in the price of natural gas to more than $4 per MMBtu by the end of 2012. Over the long term ICF forecasts that prices will increase as demand accelerates, bringing the price closer to $7 per MMBtu ($2010). The current  wellhead price of gas is currently around $3 per MMBtu, up from $1.89 in April of this year. The low prices have called into question the cost-effectiveness of energy efficiency programs, particularly those targeted at saving natural gas directly. However, despite the low natural gas wellhead prices, energy efficiency is still the lowest cost new energy resource  compared to new electricity generation resources of any fuel type. In addition, natural gas prices only affect retail electricity prices minimally because generation costs are just a small portion of the total electricity price. The average retail electricity prices are expected to remain relatively stable through 2030 while the wellhead natural gas prices are expected to rise. This means that electricity efficiency measures will not be greatly affected by natural gas prices, and the vast majority of measures remain cost-effective. Since both wellhead and retail prices are unlikely to stay low, utilities should look toward the long-term benefits of efficiency and continue supporting programs that reduce customer energy consumption. Even as sources of natural gas continue to increase, energy efficiency is still the number one new resource. Many states and utilities  already recognize the benefits of energy efficiency. Over the past 15 years, there has been a rapid increase in the use of energy efficiency (see figure), and this trend is expected to continue. 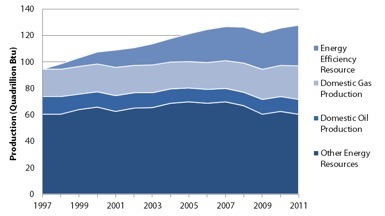 Source: EIA production and consumption data for all but energy efficiency, which came from an ACEEE analysis of EIA data. Natural gas has been a historically volatile fuel, vulnerable to storage and distribution constraints, and accidents and production disruptions. New fracking regulations  and an anticipated increase in natural gas exports  are adding  to the risk factors. Deploying energy efficiency measures lowers the demand for natural gas, which in turn reduces the threat of future price volatility, helps prevent natural gas price spikes, and assists in maintaining electrical grid reliability. Efficiency lessens a utility’s exposure to fuel price volatility by diversifying energy resources across multiple small and moderate-sized projects. Efficiency also reduces the need to deploy peaking generation resources, which prevents outages by lessening the load and stress of the power distribution network. Energy efficiency can significantly cut into the demand for natural gas in the power sector and lessen the need for construction of new natural gas power plants. New natural gas power plants require a large upfront investment and take time to come online; costs are transferred to ratepayers. Since energy efficiency is still the most cost-effective resource compared to new combined-cycle natural gas plants, energy efficiency should be deployed by states as the first measure to prevent costly construction of new natural gas plants thereby saving ratepayers money. And while natural gas is a less dirty fossil fuel with nearly half the emissions  compared to coal , natural gas still emits pollutants. Energy efficiency is a zero emission energy resource. Though the United States has made progress advancing energy efficiency, there is still an abundance of untapped energy efficiency resources available . States should make investments in energy efficiency measures first before undertaking expensive fuel switching projects. Doing so will increase stability in the electricity and natural gas sectors creates jobs , lower customer utility bills, reduce pollution, and extend the available supply of natural gas. Neal Elliott contributed to this blog.